Following up on the mild success they enjoyed with their previous Mario-themed baseball collaboration, Mario Superstar Baseball for the Nintendo Gamecube, Namco Bandai and Nintendo teamed up again to create the new Wii Mario Super Sluggers. This 2008 title features motion controls, more playable characters and other minor upgrades, and while it is a thoroughly enjoyable title, players looking for a full-on, character-branded extension of the baseball game in Wii Sports could well come away disappointed. Obviously, not everyone will like the fact that the game doesn’t actually try to simulate true baseball movements, but it is a nice alternative to other Wii baseball games. For better or for worse, Wii Mario Super Sluggers is definitely not as physically taxing as a lot of Wii sports games. Players can use either just the Wii remote or a combination of the Wiimote and the Nunchuck to play. Just using the Wii remote will result in a dumbed-down version of the game in which certain things, such as moving fielders, advancing baserunners or stealing second, are either controlled automatically or eliminated altogether. While just using a Wiimote might work well for beginners or younger players, for most people I would recommend using the Nunchuck so that you can enjoy the full experience the game has to offer. It’s simply more fun that way. To pitch, players start out will the Wiimote pointed toward the TV screen, then pull it upright toward them before swinging it back down to throw. Holding down buttons, twisting the remote and using the Nunchuck’s control stick all have different effects, allowing you to throw change-ups, curveballs, Charge Pitches and Star Pitches, all of which are explained in detail in the game’s excellent Practice Mode tutorial system. At the plate, the game again features the same kind of toned-down basic mechanics as featured in the pitching engine. You essentially just pull back your wrist before the pitch is thrown to charge your swing, and then perform a quick flick of the wrist to swing the bat when it crosses home plate. You can also bunt by holding the 1 or 2 buttons when using just the remote or Z if you have the Nunchuck equipped, and you can use those ultra-powerful, character specific Star Swings by holding both A and B while going through the bat-swinging motion. Fielding has been slightly improved from Mario Superstar Baseball. Characters auto-move to the ball when just the Wiimote is used, or can be controlled using the Nunchuck’s stick. Once you field the ball, you can throw by holding a direction on the control stick and flicking the Wiimote, and there are even special moves like Buddy Tosses and Buddy Jumps to help you out in dire situations. Baserunning is essentially unchanged. Another other thing worth mentioning is that when you’re on the field or running to a base, you can shake the remote to gain a slight speed boost. Finally, the game now includes something called Close Plays. If the runner and the ball are both going to arrive at the same base at the same time, a button will appear on the screen. Whichever player hits the correct button first "wins" the close play. It’s a neat addition that eliminates some of the chance normally associated with baseball and replaces it with skill. On the whole, the controls are fairly solid, though I do have to report that during the play-test, the game did fail to sense a particular motion or button press from time to time. Continue reading more about Wii Mario Super Sluggers on page two. Here, on page two, we continue our review of Wii Mario Super Sluggers. If you’re familiar with Mario Superstar Baseball, you might experience a feeling of déjà vu here, because Wii Mario Super Sluggers features slightly expanded and enhanced versions of that game’s play modes. Of course, you have your basic Exhibition Mode, which allows you to just play a quick pick-up game. Then there’s the one-player Challenge Mode, in which you need to track down other famous Mario characters, complete their challenges, recruit them to play on your team, battle Bowser’s minions and ultimately play and defeat the Koopa King himself. There are also several different Minigames, each focusing on a different in-game skill, as well as the returning Toy Box mode, in which up to four players alternate between pitching, hitting and fielding and try to earn as many gold coins as possible for their efforts in a fixed amount of turns. Welcome new additions include the ability to add Mii characters to your teams, the aforementioned Buddy Tosses and Buddy Jumps, and the use of Error Items to help interfere with the defense. What’s here is good, though deep down I still find myself wishing that this title had the kind of deep, almost RPG like career modes found in other Mario sports games, like Mario Golf: Advance Tour, or even in Konami’s MLB Power Pros games. I don’t care if it’s not that flashy, or whether it’s high resolution or not, or whatever. The game pretty much looks and sounds as good as it needs to. The Mario characters are all rendered well, though the Miis do look a little awkward, admittedly. The stadiums are impressive to look at. The on-screen displays, the scoreboards, pretty much everything here looks appealing and in no way hampers the gameplay. The music is an interesting mix of standard Mario game fare and ballpark-style tunes, though sadly the remixed version of the Mario Superstar Baseball theme doesn’t sound as good as the original. Good sound effects, too. Nothing here will blow your mind, but it definitely is pleasing enough on the eyes and ears to net four stars. 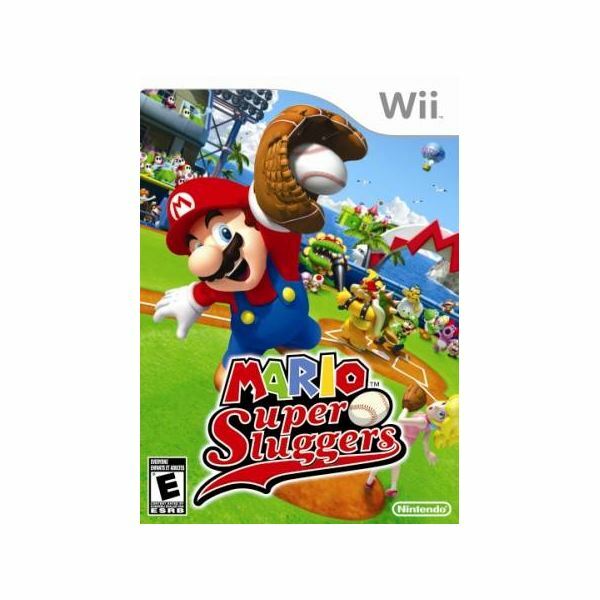 As long as you don’t let the fact that this isn’t an extremely realistic baseball sim in terms of depth or gameplay style bother you, there is plenty of fun to be had in playing Wii Mario Super Sluggers. It takes the enjoyable formula found in Mario Superstar Baseball, adds some fun new additions (particularly the Error Items, which are an absolute blast in multiplayer), and garnishes it with some light motion controls. It is great fun, especially if you can get some friends around to slug it out in multiplayer. It is a bit of a shame that there is no online multiplayer here, because this is the kind of game that just cries out for full nine-on-nine Wi-Fi action, but that’s not a dealbreaker here. I’d recommend renting the game first, especially if you’re hesitant about the control scheme.